Perhaps you want to get away, just not get away from it all. Today’s RVers are more plugged-in to electronics than ever, and today’s luxury RVs are letting them stay plugged in no matter where they go. Top high-tech features in luxury RVs include LCD TVs, home theater systems, cable/satellite TV receivers, iPod/MP3 player hookups, satellite radio, and top-notch speaker systems. Think these high-tech toys are for indoor enjoyment only? Think again! Many luxury RVs, like the Vengeance Touring Edition, have outdoor hookups for your favorite electronics.So you can enjoy the great outdoors without missing your favorite shows. Nobody enjoys fighting with their leveling system. If you’ve had to do it after a long drive (especially after dark), the idea of just touching a button or two and instantly leveling your RV seems like an incredible luxury. And once you’ve used one, you’ll wonder how you ever survived without it. Multiple trips to the local grocery store is never the high point of a vacation. Forget the mini fridge. The best luxury RVs, like the Cherokee Arctic Wolf, have residential refrigerators, so you’ll never have to live off the land, or forage for questionable entrees at the nearest convenience store. What’s worse than multiple trips to the grocery store during your vacation? Multiple trips to the laundromat. Doing the laundry is never a fun activity no matter where you; but spending your vacation time and money waiting for your clothes to get (mostly) dry using a public appliance takes that chore to a new torturous level. That’s why a stacking washer/dryer combination available on many luxury RVs is high on our must-have list. Sometimes, the appliances are offered standard equipment or as part of an option package. Quite often, however, the RV comes with washer/dryer prep and you have to purchase the actual appliances separately (like on theWildwood Heritage Glen).Either way, a washer/dryer system can be worth every penny. Luxury RVs are almost always large. After all, you need a significant amount of space to contain all that luxury. But when you need visibility on the road or when you’re trying to maneuver into your site, that can be a problem; rear-view mirrors are useless, and even side-view RV mirrors don’t give you the visibility you need. Rear-view cameras allow you to see what’s happening around on the highway and what’s behind you when you park right from your driver’s console. Problem solved! Manually opening, closing, and adjusting an RV awning can be a pain in the back. An electric awning allows you to cast some shade (or retract it) at the push of a button – making your set up and take down easier than ever. What’s so “luxurious” about a heated holding tank? If you’ve ever had to thaw out the contents of a holding tank, you’d know the answer to that. Heated holding tanks keep water/fluids at temperature where they remain in a liquid state, ready to use or drain at any time and in any temperature. Seasoned campers – especially those who have spent any time in a tent – know that a goodnight’s sleep in the great outdoors can seemdownright decadent. Imagine how much rest you’ll get if you’re sleeping on a pillow-top or adjustable mattress! Adjustable mattress also make it easy to read or watch TV in bed, making your luxury RV a true home away from home. LED lighting has a bright future in the RV industry. LED bulbs use approximately 90% less energy than halogens or incandescent bulbs. They also last much longer and are vibration resistant, so they’re better for the road. Another bonus: LED bulbs produce very little heat, so they won’t heat up the inside of your RV. You’re on vacation – relaxation is your top priority. So sit back, relax, and kick your feet up in comfort. Forget folding chairs, cots, and barely-upholstered benches. 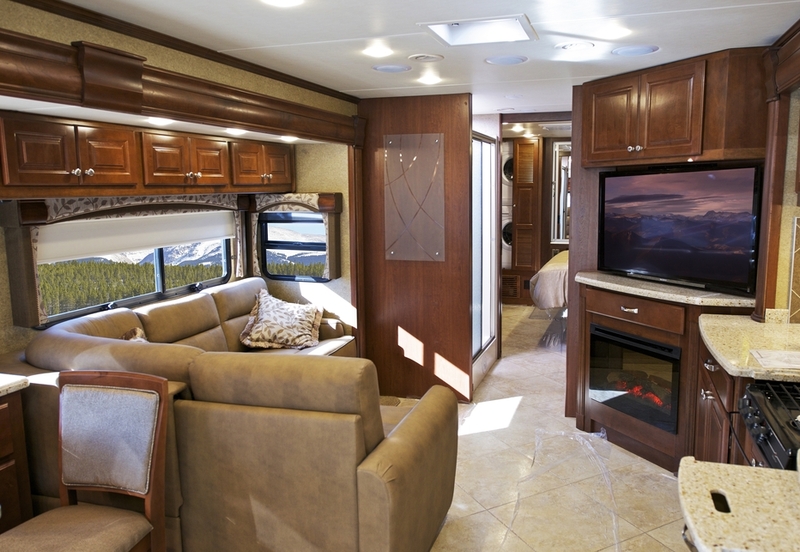 High-end recliners and sleeper sofas are the furniture of choice for today’s luxury RVs. In fact, the Silverback edition fifth wheel from Cedar Creek even offers power optional wall-hugger theater seating from La-Z-Boy®, one of the top names in residential reclining furniture. Want to learn more about Luxury RV features?